Citation: Shammas RL, Buretta KJ, Grimm NL, et al. The Use of Regional Flaps for the Repair of Synovio-Cutaneous Fistulas of the Shoulder after Attempted Rotator Cuff Repair: A Report of Two Cases. J Bone Rep Recommendations. 2016, 2:3. The treatment of rotator cuff tears has become one of the most common orthopaedic sports procedures [1,2]. While this operation has a low morbidity, it is not without risk for complications such as chondrolysis, athrofibrosis, nerve damage, and infection [3-7]. The development of a synovia-cutaneous fistula is another rare, but serious, complication that has been described after rotator cuff repair [7,8]. Synovia-cutaneous fistulas have been described as squeal of postoperative infections or suture reactions necessitating surgical debridement . Fistula formation has also been attributed to a sequence of events that include excessive tension placed on the rotator cuff tendons and deltoid muscle during repair leading to inflammation, necrosis, and, ultimately, dehiscence over the glen humeral joint. Synovia-cutaneous fistulas have been primarily reported as complications following arthroscopic knee surgery [7-11]. Literature describing the same complication after arthroscopic shoulder surgery is limited. In these reports, the majority of synovia-cutaneous fistulas in the shoulder were successfully treated with debridement and primary closure; however, there have been reports of persistent fistulous connections requiring local flaps for obliteration [7,8]. While the use of a local rotational flap for shoulder reconstruction is widely reported, its role in the repair of synovia-cutaneous fistulas of the shoulder has not been well defined [4,5,7,8,12-14]. In this case series, two patients underwent shoulder arthroscopy for the treatment of rotator cuff tears and subsequently developed synovia-cutaneous fistulas of the shoulder. In both cases, debridement and primary closure were unsuccessful, and a local flap was required to obliterate the dead space created by a large facial dehiscence over the glen humeral joint. 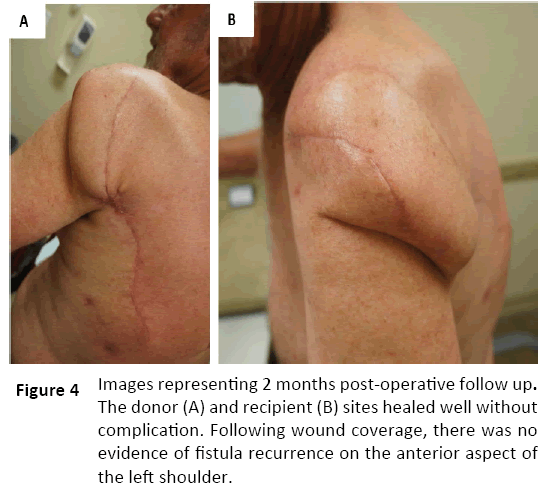 The purpose of this report is to present the local rotational flap as a treatment option for synovia-cutaneous fistulas of the shoulder and to emphasize the importance of recognizing when primary closure may not be sufficient for adequate repair. A 67-year-old male with a past medical history significant for diabetes, hypertension, and hypercholesterolemia underwent a right rotator cuff and a biceps tendon repair complicated by the development of a draining sinus. In the six months following the repair, the patient underwent multiple attempts at irrigation, wound debridement, and negative pressure wound therapy. Due to the persistence of the draining fistula, the patient was referred to plastic surgery for evaluation and treatment. The patient’s physical exam was notable for a draining sinus tract with granulation tissue overlying the anterior surface of the right shoulder. The patient’s range of motion at the shoulder was severely limited, with an inability to elevate the shoulder beyond 90 degrees. An MRI of the shoulder revealed an anterior soft tissue tract extending from the wound surface to the cortex of the humeral head and T2 signal enhancement within the humeral marrow, concerning for underlying osteomyelitis. Based on the history and physical exam, the decision was made to proceed with extensive debridement and closure using vascularized tissue. The patient was brought to the operating room and the existing fistula tracts including the involved humeral head were widely debrided. Antibiotic beads were placed into the proximal humorous. The plastic surgery team then designed a pedicle Para scapular flap based medially along the infraclavicular region. The flap was mobilized down to the pectoral fascia and then rotated and inset into the debrided wound bed without undue tension. Cultures obtained during the procedure were negative for bacterial infection. The patient recovered without event and was discharged to home on a ten-day course of Augmentin. At the patient’s four-month post-operative clinic visit, radiographs showed evidence of resolution of the previous osteomyelitis. The patient was able to forward flex and abduct his shoulder to 120 degrees, and he described no physical limitations or pain. A 63-year-old male with a past medical history significant for hypertension, tobacco use, and hyperlipidaemia was referred from an outside hospital for a postoperative wound complication following attempted open debridement of a left torn rotator cuff approximately six weeks prior. At the time of initial surgery, the cuff tear was noted to be unreconstructable. Two weeks after the initial operation, a small opening draining a thin, non-odorous, pale yellow fluid developed at the previously healed shoulder incision. The wound was initially managed conservatively with local wound care in hopes that it would close by secondary intention. Over the next four weeks, however, both the size of the wound and the amount of drainage from the defect increased. The patient was then referred to plastic surgery for evaluation and treatment. The patient’s physical exam revealed a full-thickness wound with surrounding rub or over the anterolateral aspect of the shoulder measuring 2 cm long x 1 cm wide with clear intraarticular extension (Figure 1). The patient’s range of motion at the shoulder (35 degrees of flexion and 60 degrees of abduction) was limited with significant pain on motion. Cultures of the fluid were obtained by joint aspiration and were negative for bacterial or fungal growth. The decision was made to proceed with extensive debridement and closure using vascularized tissue. Figure 1: The synovio-cutaneous fistula can be seen on the anteriosuperior portion of the left shoulder. The patient’s physical exam revealed a full-thickness wound with surrounding erythema over the anterior deltoid muscle measuring 2 cm long x 1 cm wide with clear intraarticular extension. The patient was brought to the operating room, and the existing fistula tract was explored. It was noted to communicate with the glen humeral joint on the lateral aspect of the shoulder (Figure 2). 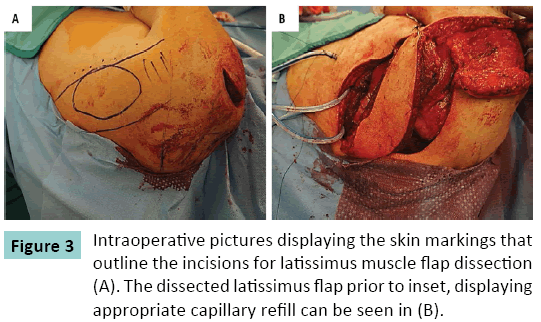 The decision was made to proceed with a pedicle my cutaneous latissimus flap (Figure 3). The flap was transposed into the defect created by debridement of the fistula tract and surrounding unhealthy tissue. The flap donor site was closed primarily. The patient was discharged on postoperative day five to home with a prescription for two weeks of Amoxicillin. 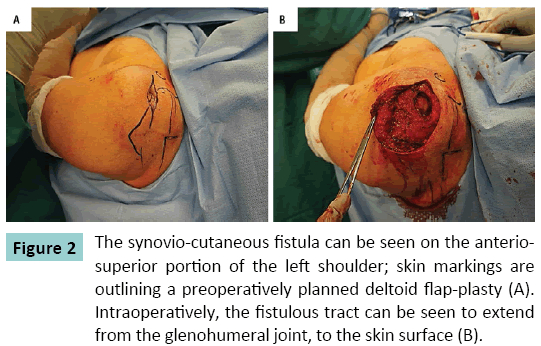 Figure 2: The synovio-cutaneous fistula can be seen on the anteriosuperior portion of the left shoulder; skin markings are outlining a preoperatively planned deltoid flap-plasty (A). Intraoperatively, the fistulous tract can be seen to extend from the glenohumeral joint, to the skin surface (B). Figure 3: Intraoperative pictures displaying the skin markings that outline the incisions for latissimus muscle flap dissection (A). The dissected latissimus flap prior to inset, displaying appropriate capillary refill can be seen in (B). The patient’s recovery was uneventful, and the patient was noted to have no recurrent fistula formation (Figure 4). The patient had improved shoulder range of motion with the ability to flex to 50 degrees and abduct to 65 degrees with minimal pain. Figure 4: Images representing 2 months post-operative follow up. The donor (A) and recipient (B) sites healed well without complication. Following wound coverage, there was no evidence of fistula recurrence on the anterior aspect of the left shoulder. In our report, one patient suffered from a chronically recurrent fistula of the shoulder despite multiple attempts at debridement and healing via secondary intention. The second patient was initially managed conservatively with wound packing before the decision was made to use myocutaneous flap for coverage of the shoulder defect; this patient did not undergo any prior attempts of debridement or primary closure of the defect. In both cases, following closure with a regional, vascularized flap, the patients experienced resolution of their chronically draining wounds, improved function in the affected limbs, and relief of pain. The knee is the most commonly reported location to develop synovia-cutaneous fistulas following arthroscopic surgery, with an incidence of 0.5% to 1% [15-17]. In general, these patients respond well to immobilization of the knee or surgical excision of the fistulous tract and primary closure [8,15-17]. Similarly, of the available cases of synovia-cutaneous fistula reported in the shoulder, most have been managed with debridement and primary closure. In the setting of an underlying infection, primary closure of a synovia-cutaneous fistula is associated with higher rates of failure, prompting the use of a regional flap for successful wound coverage without recurrence of the fistula or abscess formation [18-22]. Similar to prior studies that detailed fistula tract formation in the knee secondary to an underlying surgical site infection or facial dehiscence, it is likely that the fistulous tract developed in our patients’ secondary to a either a postoperative infection or inflammation and necrosis of the rotator cuff tendons and tissues surrounding the glen humeral joint [8,18-22]. In both of our reported cases, the deltoid fascia was noted on perioperative imaging and intraoperative exam to be markedly dehisced and unsuitable for primary closure. As a result, a vascularized regional flap was chosen for wound coverage. Prior studies have noted that similar to our findings, the draining shoulder sinuses communicated with the glen humeral joint [7,8]. The authors of these reports then hypothesized that the dehiscence of the rotator cuff and deltoid following repair allows for fistulous tract formation and that with shoulder motion, the synovial fluid is pumped to keep the fistula open [7,8]. In our series, both patients were successfully treated with adequate excision of the tract and appropriate flap coverage. Furthermore, both patients had improved range of shoulder motion and significant pain relief. In the setting of obvious joint involvement and/or a chronically infected synovia-cutaneous fistula, the decision to proceed directly to vascularized tissue coverage should be considered. If joint involvement or the presence of an underlying infection is uncertain, magnetic resonance imaging can aid in confirming the diagnosis, and either situation should prompt the discussion for potential use of a regional flap [11,23]. Shoulder reconstruction using a pedicle flap, such as the latissimus dorsa, is a widely accepted reconstructive option due to its reliability and ability to cover large wound defects with ease [24-26]. In cases of synovia-cutaneous fistulas, the use of a vascularized muscle flap is advantageous to obliterate dead space, treat osteomyelitis, and provide adequate bulky coverage of orthopaedic hardware [27,28]. The consideration for use of vascularized tissue is even more important for cases where there is suspicion for an underlying infection [29,30]. A study published by Mirzayan et al. details the use of my cutaneous flaps in 7 patients with deep shoulder infections . In this study, the authors describe that inadequate soft tissue coverage of the glen humeral joint leads to the breakdown of the skin and subcutaneous tissue, and may lead to sinus tract formation. In these patients, the use of a muscle to cover the wound and fill the dead space can help provide a better seal for improved wound healing and infection control . Previously reported flaps used for local coverage of deep shoulder wounds following rotator cuff repair include the latissimus dorsa and pectorals major, both of which have been reported to have favourable outcomes [29-31]. Modern reconstructive literature indicates that utilization of well vascularized fasciocutaneous flaps is equivalent to use of a muscle flap for wound coverage, and the choice of the regional flap is at the discretion of the reconstructive surgeon [32-36]. Deep infection following shoulder arthroscopy for rotator cuff repairs is a rare problem that can lead to the formation of a chronically draining synovia-cutaneous fistula that affects the glen humeral joint. Furthermore, the excessive tension placed on the rotator cuff tendons and deltoid during arthroscopic repair and the resultant inflammation may contribute to tissue necrosis and facial dehiscence over the glen humeral joint, allowing for fistula formation. When this complication occurs, it is imperative that a diagnosis is established as early as possible to avoid unnecessary procedures and prolonged use of antibiotics. Surgeons should be aware that when adequate soft tissue coverage cannot be accomplished over the glen humeral joint via primary closure, there are local flaps available to provide complete coverage over the joint. Pauzenberger L, Grieb A, Hexel M, Laky B, Anderl W, et al. (2016) Infections following arthroscopic rotator cuff repair: incidence, risk factors, and prophylaxis. Knee surgery, sports traumatology, arthroscopy : official journal of the ESSKA. PMID: 27342982. Colvin AC, Egorova N, Harrison AK, Moskowitz A, Flatow EL (2012) National Trends in Rotator Cuff Repair. J Bone Joint Surg Am 94: 227-233. Gulotta LV, Nho SJ, Dodson CC, Adler RS, Altchek DW, et al. (2011) Prospective evaluation of arthroscopic rotator cuff repairs at 5 years: part I-functional outcomes and radiographic healing rates. J Shoulder Elbow Surg 20:934-940. Marecek GS, Saltzman MD (2010) Complications in shoulder arthroscopy. Orthopedics 33:492-497. Mohammed KD, Hayes MG, Saies AD (2000) Unusual complications of shoulder arthroscopy. J Shoulder Elbow Surg 9:350-353. Segmuller HE, Alfred SP, Zilio G, Saies AD, Hayes MG (1995)Cutaneous nerve lesions of the shoulder and arm after arthroscopic shoulder surgery. J Shoulder Elbow Surg 4: 254-258. Richards RS, Curl LA, Moorman Iii CT, Mallon WJ (2006)Sterilesynovio-cutaneous fistula: A potential complication of repair of large and massive rotator cuff tears. J Shoulder Elbow Surg 15:436-439. Torres JA, Wright TW (1999) Synovial cutaneous fistula of the shoulder after failed rotator cuff repair. Orthopedics 22:1095-1097. Kampen VA, Hinten F (2011) Diagnosis and treatment of postsurgical synovial fistula of the knee. J Knee Surg 24:295-297. Odumala OO, Ayekoloye CI, Perera SD (2001) Synovial knee fistula: A cause of prolonged morbidity. Arthroscopy: Arthroscopy 17:640-641. Letter HP, Limback J, Wasyliw C, Bancroft L, Scherer K (2016) Synovial cutaneous fistula complicating a reverse total shoulder arthroplasty. Radiol Case Rep 11: 98-101. Behnam AB, Chen CM, Pusic AL, Mehrara BJ, Disa JJ, et al. (2007) The pedicledlatissimusdorsi flap for shoulder reconstruction after sarcoma resection. Ann SurgOncol 14:1591-1595. doi: 10.1245/s10434-006-9292-5. Thorsness R, Romeo A (2016) Massive Rotator Cuff Tears: Trends in Surgical Management. Orthopedics 39:145-151. Namdari S, Voleti P, Baldwin K, Glaser D, Huffman GR (2012)Latissimusdorsi tendon transfer for irreparable rotator cuff tears: a systematic review. J Bone Joint Surg Am 94:891-898. DeLee JC(1985) Complications of arthroscopy and arthroscopic surgery: Results of a national survey. Arthroscopy 1:214-220. Allum R (2002) Complications of arthroscopy of the knee. 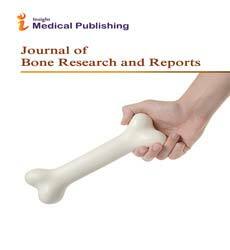 The Journal of bone and joint surgery British 84:937-945. Li PLS, Chakrabarti AJ, Dowell JK (1996)PPersistent synovial fistula after arthroscopy: is titanium synovitis a risk factor? J Bone Joint Surg Br 78:322-323. Yiannakopoulos CK (2007) Diagnosis and treatment of postarthroscopic synovial knee fistulae: a report of four cases and review of the literature. J Knee Surg 20:34-38. Bamford DJ, Paul AS, Noble J, Davies DR (1993) Avoidable complications of arthroscopic surgery. J RoyCollegSurg of Edinb 38:92-95. Jain S, Varma KS (1999) External synovial fistula of the knee joint and its treatment with free radial artery fasciocutaneous flap. Europ J of Plas Surg.;22(4):190-192. Li PL, Chakrabarti AJ, Dowell JK (1996) Persistent synovial fistula after arthroscopy: is titanium synovitis a risk factor? J Bone Joint Surg Br 78:322-323. Mendez-Fernandez MA (1993) Treatment of chronic recurrent synovial fistulae with myofascial flaps. Br J PlastSurg46:303-306. Roberts CC, EkelundAL, Renfree KJ, Liu PT, Chew FS (2007) Radiologic assessment of reverse shoulder arthroplasty. Radiographics 27:223-235. Aubá C, Yeste L, Herreros J, Hontanilla B (2004) Upper-third arm and shoulder reconstruction with the island latissimusdorsi flap. J Shoulder Elbow Surg 13:676-679. Rasheed MZ, Tan BK, Tan KC (2009)The extended lower trapezius flap for the reconstruction of shoulder tip defects. Ann PlastSurg 63:184-187. Kim JS, Lee JS, Yoon JO, Park JB (2009) Reconstruction of the shoulder region using a pedicledlatissimusdorsi flap after resection of soft tissue due to sarcoma. J PlastReconstrAesthetSurg 62:1215-1218. Mathes SJ, Alpert BS, Chang N (1982) Use of the muscle flap in chronic osteomyelitis: experimental and clinical correlation. Plastic and reconstructive surgery 69:815-829. BunticRF, Horton KM, Brooks D, Lee CK (2008)The free partial superior latissimus muscle flap: preservation of donor-site form and function. PlastReconstrSurg 121:1659-1663. Meiners T (2003) Use of a latissimusdorsi flap for treatment of infection in a neuropathic shoulder joint. Spinal cord 41:465-469. Harris PA, Kelly M, Calvert PT, Gateley D (2004)The use of a pectoralis major muscle turnover flap to cover anterior shoulder defects after infected rotator cuff repair. J Shoulder Elbow Surg 13:235-238. Mirzayan R, Itamura JM, Vangsness CT, Jr., Holtom PD, Sherman R, et al. (2000) Management of chronic deep infection following rotator cuff repair. J Bone Joint Surg Am 82:1115-1121. Griffin M, Hindocha S, Malahias M, Saleh M, Juma A (2014) Flap Decisions and Options in Soft Tissue Coverage of the Upper Limb. Open Orthop J 8:409-414. doi: 10.2174/1874325001408010409. Adkinson JM, Chung KC (2014) Flap Reconstruction of the Elbow and Forearm: A Case-Based Approach. Hand Clin 30:153-163. Ng ZY, Salgado CJ, Moran SL, Chim H (2015) Soft Tissue Coverage of the Mangled Upper Extremity. SeminPlastSurg 29:48-54. Sofiadellis F, Liu DS, Webb A, Macgill K, Rozen WM, et al. (2012)Fasciocutaneous free flaps are more reliable than muscle free flaps in lower limb trauma reconstruction: experience in a single trauma center. J ReconstrMicrosurg 28:333-340. Paro J, Chiou G, Sen SK (2016) Comparing Muscle and Fasciocutaneous Free Flaps in Lower Extremity Reconstruction--Does It Matter? Ann PlastSurg 76:213-215.